“It is so much fun to grow your own stuff,” said Barb Sahl, who teaches Laramie County Master Gardener classes. Plus, you can grow varieties that may not be available at local nurseries. Best of all, you can time their growth so that they are the optimum size for transplanting to the garden. Yes, even though it looks a lot like winter, now is actually a great time to start your garden. Get seeds that are in packages dated for this season. The older the seeds, the less likely they will germinate. Look for short-season vegetables so you can harvest before frost. The “Silvery Fir Tree” tomato that I tried last year is supposed to produce a ripe tomato in 58 days after transplanting outdoors. Most vegetables have short-season varieties available, even eggplant. “Orient Express” is rated for 58 days to maturity, and “Marketmore,” a cucumber rated for 60 days. Cheyenne native Willi Galloway, author of “Grow Cook Eat,” recommends 75 days for our area. Check to see if seeds are better directly seeded in the garden—some don’t transplant well. Look for how many weeks before the last frost you should start seeds indoors. Our average last frost date is May 24. The packets will also tell you proper planting depth. For tiny seeds, it is so scant, place them on the soil surface, sprinkling a little dry soil on top and moistening with a mister. Check to see if your seeds need special handling. To germinate, some need soaking or nicking or exposure to direct light or to sit in darkness. Some even need to cool in the refrigerator. Kathy Shreve, another Master Gardener mentor, is adamant about buying special soil designed for starting seeds. It’s available in most places selling gardening supplies. You will have a higher rate of success because it’s sterile—it doesn’t carry fungus that can kill seedlings, and it’s lightweight so the seeds don’t have to struggle through the heaviness of typical garden soil. I don’t need a lot of this special mix. Once the seedlings have several true leaves, not just those first two “seed leaves,” I can move them into larger pots with regular, cheaper, potting soil. Because the seed starter soil is super-dry, be sure to mix it with water before filling the pots. Kathy and Barb both swear by “accelerated propagation systems.” There are several brands, but the one we use is from www.LeeValley.com. The clear plastic dome keeps the soil surface moist until the seeds sprout. But the water reservoir is key. A wicking system waters each cell from below so that seeds are never jostled from top watering. And before seeds sprout, the reservoir may not need filling for several days, letting you take a vacation before the more demanding part of plant parenthood begins. 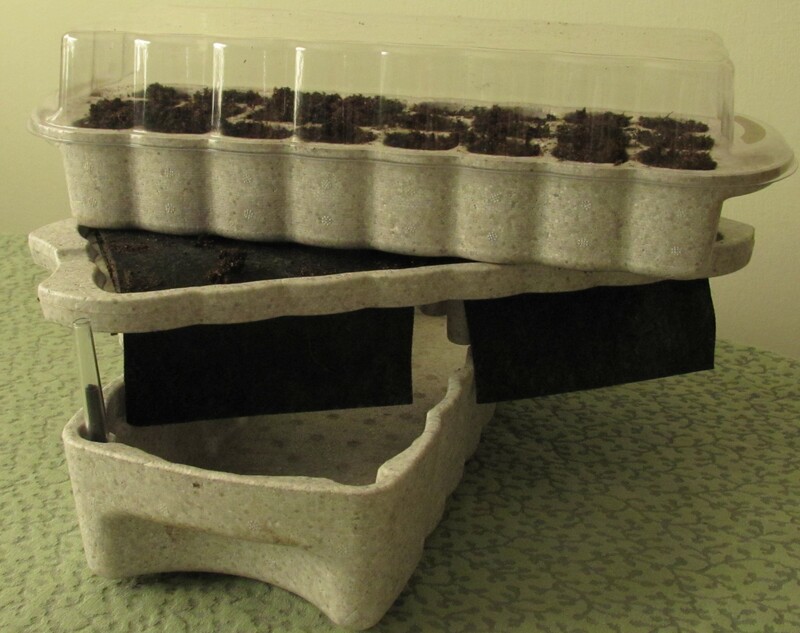 Because the seedlings require only a few weeks before they need repotting, I have been able to start all my small seeds in shifts in this watering system, which is the size of an egg carton. More robust seed varieties do well in other containers covered with plastic wrap until they sprout. I scavenge for my other containers, carefully reusing plastic pots from plant sales and nursery purchases, as well as whatever stores throw out. It’s appalling how much plastic waste the horticultural industry produces. Any container you can sanitize can be reused—styrofoam cups, tall drink cups (especially for tomatoes), yogurt cups—just be sure to poke a lot of holes in the bottom for drainage. Clean them and then soak them in a 10 percent bleach solution for a few minutes, then rinse. There are pots made from compressed fibers of various kinds. The idea is that you can plant the pot and all right into the garden and the roots will grow right through the walls. My experience is that the roots stay in the pot. It is better to tear it away when transplanting and throw the pot in the compost pile. 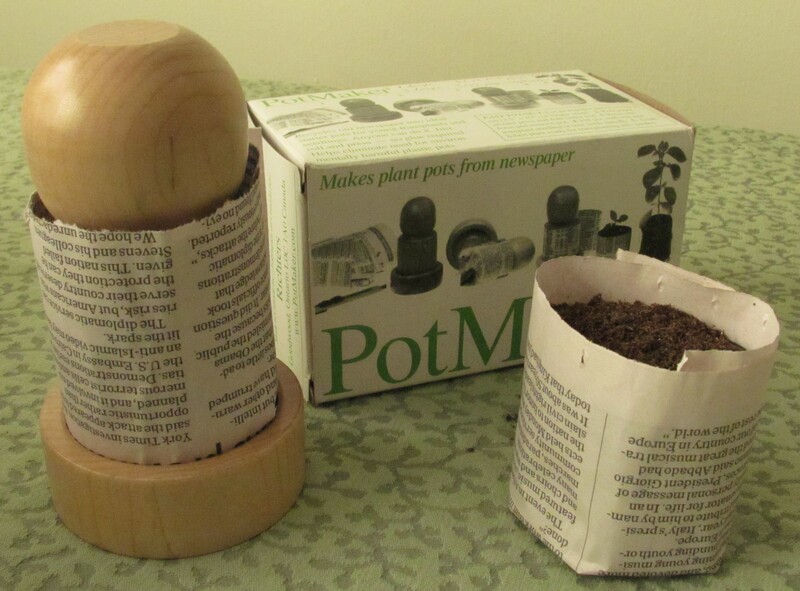 Last year I tried the “PotMaker,” a little wooden cylinder that you roll a strip of newspaper around several times, fold the bottom inch or so underneath and crimp the fold. Remove it from the cylinder and fill it with potting soil. If handled carefully, or rather not handled after setting in a plastic tray, these little pots will hold up until the plant is ready for transplanting outdoors. While newspaper is degradable, I prefer to remove it, if there aren’t too many roots already growing through it. You could use any cylindrical object to make the size pot of your choice. Wrap the paper around two to three times, but not so tightly you can’t slip it off. And use a freshly read newspaper—nothing that’s been sitting out for weeks accumulating disease spores. Some types of seeds, such as vegetables of tropical origin such as tomatoes, peppers and eggplants, are happier with warmth from an electric heat mat placed beneath them. Vegetables from cold climates, like cabbage and broccoli, don’t care so much. 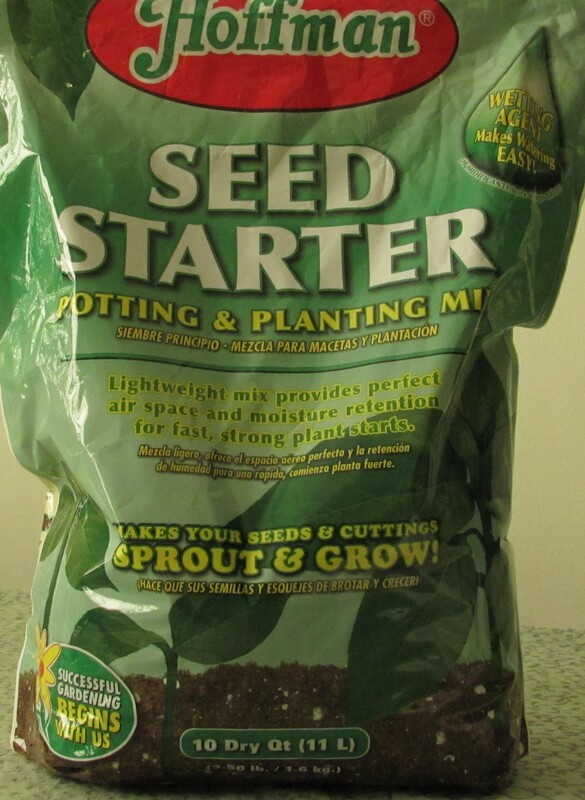 Yes, this is an investment, but especially necessary if you are starting your seeds in a chilly basement. Last year, I dispensed with the heat mat when I decided to start my seeds in the hall bathroom instead of the basement. It has no windows, just a skylight, and is the warmest spot in the house—over 65 degrees. No one uses the bathtub now so I put in freestanding shelves and hung up lights. 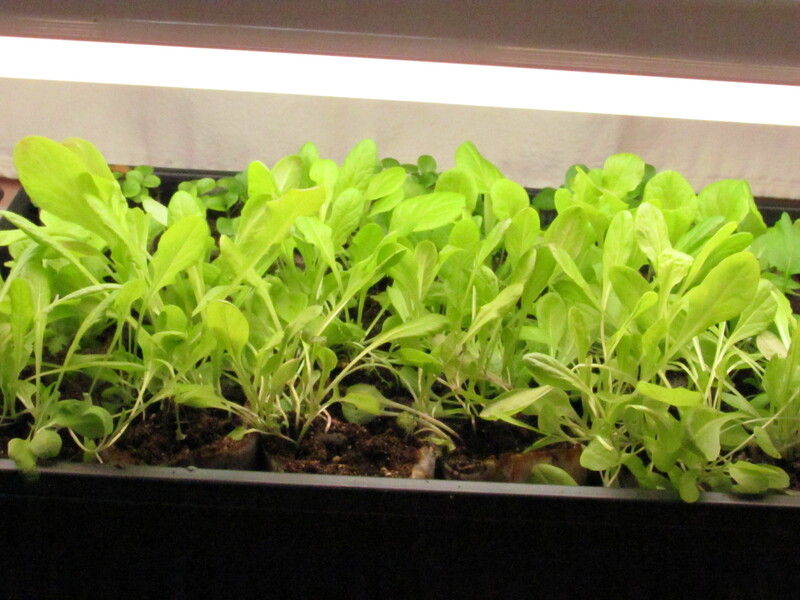 “A windowsill is hardly ever sufficient to grow good stocky seedlings,” said Kathy. Catalogs are happy to sell you special grow lights, but for the brief time seedlings are with you, a 4-foot shoplight with two fluorescent bulbs, 5000-6500 degrees Kelvin (daylight is approximately 5,600 degrees), is adequate for two standard 10-by-20-inch flats. Turn on the lights when you get up in the morning, and turn them off at bedtime. Keep the top of the plants about 1 to 2 inches from the light bulbs. Either hang the lights on chains so that their height can be adjusted, or stack stuff under the flats to bring them close to the lights. Really! Both Barb and Kathy keep small, ordinary oscillating fans going across the room from their seedlings. It prevents damping off disease, when seedlings keel over and die. Also, plants respond to air movement by reinforcing the strength of their stems so you’ll have stockier, stronger plants. This has worked for me when I started seeds two years ago. Last year, in the bathroom, I didn’t use a fan and didn’t lose any plants. However, Kathy and Barb’s plants did look better than mine. More indoor plants are lost to overwatering than anything else. Once your seedlings germinate, take off any plastic covers and make sure the surface of the soil gets a bit dry before the next watering. As the seedlings grow, their watering schedule will change. Plan to check them at least every day. Most seed-starting and regular potting soils have fertilizer added, so let the little plants chew on that a few weeks before giving them anything more—and then figure half strength of whatever the directions recommend. Don’t worry if by the end of May your plants aren’t blooming and as mature-looking as the ones at the store. Blooming plants sell better, but often their roots are pot-bound in those tiny containers and the plants, especially flowers, may not really recover to grow much the rest of the summer. You can make sure your starts aren’t pot-bound and are at just the right stage to jump into the garden and keep growing. 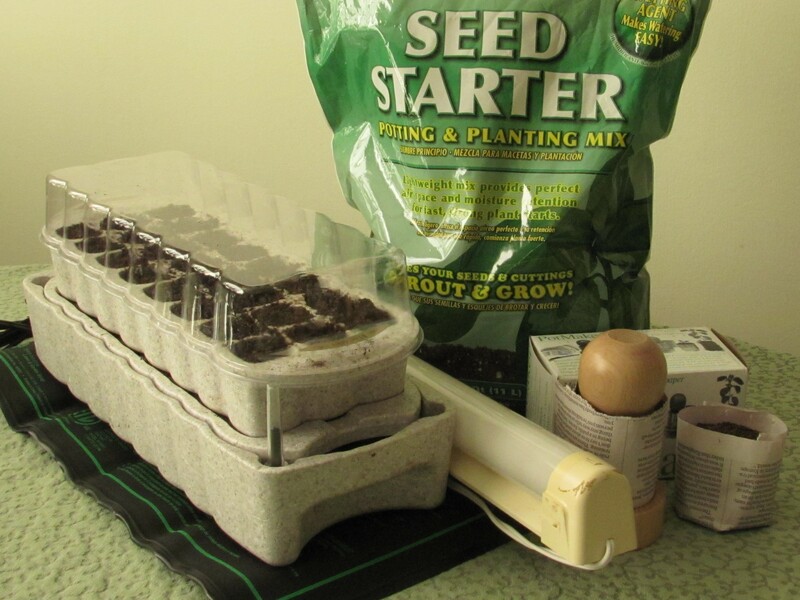 Categories: Starting seeds indoors | Tags: accelerated propagation system, Cheyenne, frost date, grow light, heat mat, Lee Valley, PotMaker, seed starting, Wyoming | Permalink. My eyes were bigger than my garden when I shopped the seed catalogs last month. In my quest this summer to cultivate an early tomato from seed, as well as an annual (the dwarf cosmos), I now have 18 packets of seed sorted by when they need to be started indoors. By the way, it is now time to get those seeds started, if you haven’t already. But some plants do best when seeded directly into the garden. I have five packets of sunflowers on standby, along with seeds for lettuce and radishes. I’ve done the calculations (number of days to germination, plus two weeks to transplant size before May 24, the average last frost date), or used the information on the seed packet, and marked a spare calendar with the planting dates for each plant. The earliest is Marine Heliotrope Peruvianum, very tiny seeds, which I started March 1. I’m not familiar with this annual – it showed up instead of a marigold I ordered, but I’m curious. I’m the gardener who lets things sprout in the perennial bed and waits to see what they are—if I don’t immediately recognize them as bindweed or thistle. There are three factors important to seed starting success, says Shane Smith, director of the Cheyenne Botanic Gardens. They are: sterile pots; new, sterile soil and planting seeds to a depth twice the width of the seed. Pots need to be sterilized with a good scrub for ones being reused, plus a few swishes in a 10-percent bleach solution. As for soil, you could bake your own at 250 degrees until it reaches 140 degrees for 30 minutes to sterilize it, but it smells. Instead of garden soil, buy fresh “soil-less” potting soil, which is light and fluffy and usually sterile. If you have time, leave it out in sub-freezing weather for a couple of weeks to kill everything. You can make your own soil-less seedling mix: 3 parts milled sphagnum, 2 parts perlite and 1 part vermiculite. For my pots, I’m trying a bag of “Seed Starting Jiffy-Mix.” It’s very dry and needs to be mixed with water before putting it into the little seed-starting cells—otherwise it sheds any water I pour on it. The rule of (the green) thumb is plant no deeper than twice the width of the seed (not the length or thickness), Smith says. Seeds have evolved to sprout with just heat and moisture (though a few actually need light, too), but if they don’t reach sunlight before they use up the energy stored within the seed, you’ll never see them. Master Gardener Kathy Shreve demonstrated how to pick up a very tiny seed: Use the end of a dampened toothpick, and then brush the seed onto the surface of the growing medium. Pots need to have drainage holes in the bottom. While you are waiting for seeds to germinate, the growing medium can’t get too soggy or too dry. I was particularly intrigued with Shreve’s Advanced Propagation System. It is a commercially available miniature, self-contained greenhouse, with a tray of planting cells, a clear plastic dome lid to keep moisture in and a water reservoir below that should only need filling every few days. The ends of a porous mat hang down into the reservoir and capillary action brings moisture across the mat placed under the planting cells where the soilless planting medium wicks it up to the plants. A less fancy method is to gently spritz the soil surface when necessary and lay plastic wrap over it until sprouts show. Verena Booth said she sprouts difficult seeds the way alfalfa is sprouted for salads, and then pots them. Or try folding seeds in a wet paper towel placed in a plastic bag. It worked for me. The only sunny windowsill at our house is already full, so I’m using a 4-foot fluorescent shop light suspended over the workbench downstairs. Windowsills are rarely bright enough and ours would be a poor choice anyway since we have low-e glass which keeps out a part of the spectrum and makes my houseplants leggy. However, Master Gardeners Shreve and Barb Sahl agree that cool white fluorescent bulbs work fine for starting plants. The blue spectrum is perfect for seedlings. Keep the light close to the seedlings, 1 to 2 inches above. If the height of the light isn’t easy to adjust, or you have plants of different sizes at the same time, add blocks of wood or something under the short plants’ pots to get them close enough. Shreve gives her seedlings light 16 hours a day. Sahl leaves her lights on 24/7. Damping off disease breaks a lot of hearts. One day the brave little seedlings are vigorously reaching for light and the next they are lying flat—rotted off at the soil surface. Sterile soil helps prevent this. Shreve and Sahl also use moving air, a preventive seeds started outdoors get naturally. But it’s too cold to open a window, so try a fan set on low and placed across the room. The other benefit to subjecting seedlings to a breeze is stronger stems. Heat, especially for plants of tropical origin—tomatoes and peppers—is necessary to germinate their seeds. 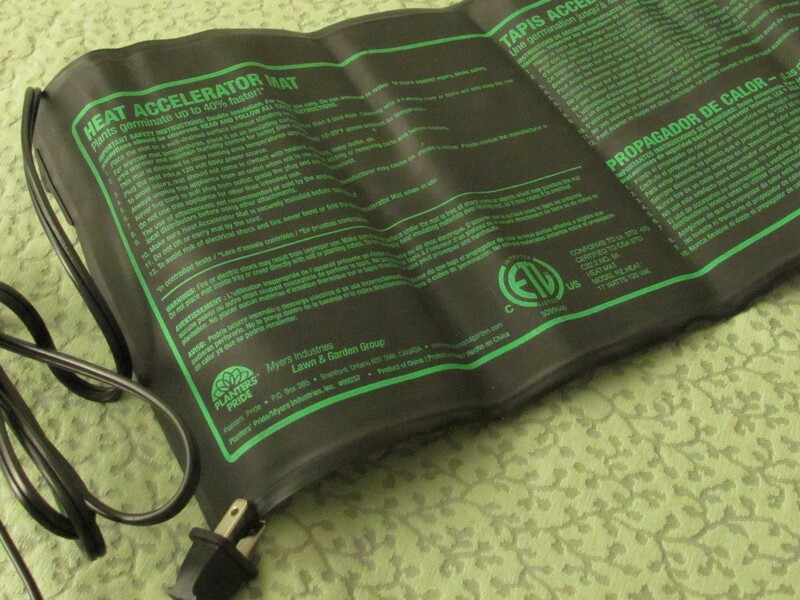 The cost of plugging in a heat mat I bought through a garden supply store to put under a flat of seedlings is probably less than turning up our household thermostat to 80 degrees. A week after planting, 30 percent of my heliotrope seeds had sprouted. Before April I plan to start the tomato and cosmos. If all goes well, I may be looking for ways to hang flats of seedlings under all of our fluorescent ceiling lights. When sterilizing potting soil by baking it in your oven at 250 degrees, it must bake 30 minutes after the soil temperature reaches 140 degrees. 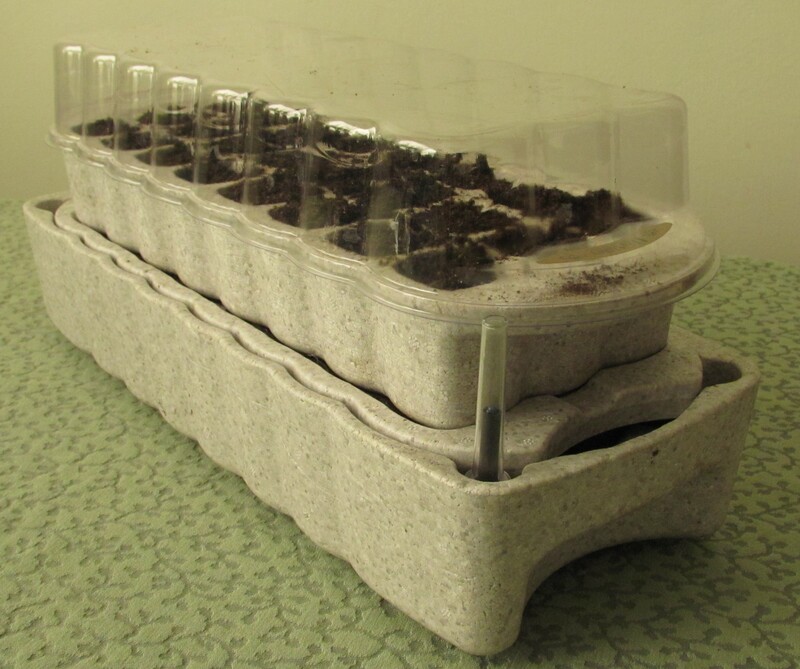 Categories: Starting seeds indoors | Tags: Advanced Propagation System, damping off, heat mat, seed, seedling, soil sterilization, starting seeds indoors | Permalink.